The supernova remnant HBH 3 glows with infrared light in this photo from NASA's Spitzer Space Telescope. Infrared light with a wavelength of 3.6 microns is shown in blue, while lower-energy infrared light with a wavelength of 4.5 microns is shown in red. Spitzer captured this image in May 2010, and NASA released it on Aug. 2, 2018. Red streaks of energized gas left over from an ancient stellar explosion branch across the cosmos in this spectacular new photo from NASA's Spitzer Space Telescope. This supernova remnant, known as HBH 3, is one of the largest in the Milky Way galaxy and measures about 150 light-years across. It is also one of the oldest; the star that exploded to create this cosmic spectacle did so 80,000 to 1 million years ago, NASA officials said in a statement. Parts of the supernova remnant HBH 3 do glow with visible light. "The branches of glowing material are most likely molecular gas that was pummeled by a shockwave generated by the supernova," NASA officials said. "The energy from the explosion energized the molecules and caused them to radiate infrared light." Along with the supernova remnant, the image shows parts of some hazy, white clouds known as W3, W4 and W5. These regions form a large molecular cloud complex in the constellation Cassiopeia. To create this image of HBH 3 and its surrounding clouds, researchers mapped the data from the Spitzer Space Telescope by assigning colors to two types of infrared light emitted by the region. Infrared light with a wavelength of 3.6 microns is shown in blue, while lower-energy infrared light with a wavelength of 4.5 microns is shown in red. 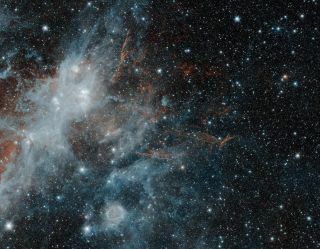 The clouds of W3, W4 and W5 appear white because they emit both of these wavelengths of light, but the supernova remnant appears red because it emits only the 4.5-micron infrared light. NASA's Fermi Gamma-Ray Telescope has also detected high-energy gamma-rays coming from the cloudy region around HBH 3. "This emission may be coming from gas in one of the neighboring star-forming regions, excited by powerful particles emitted by the supernova blast," NASA officials said. This image from the Spitzer Space Telescope was captured in May 2010 and was released on Aug. 2, 2018.